The second Borderway UK Dairy Expo, held at Carlisle was without a doubt a showcase for the UK Dairy Industry, and built further on the success of last year’s first event. The two day event featured some of the industry’s finest genetics, introduced the UK’s first ever Embryo Tag sale and hosted several thousand visitors from Britain and around the world. Taking the overall Grand Champion of Champions was Lavenham Adeen, who had earlier been awarded the Grand Champion Holstein Cow. Paraded by Mark Nutsford, who owns her in partnership with Anthony Grimshaw and Stephen Bell, she was selected from over 300 entries by top international judges Barclay Phoenix and Bruce Mode, who had come from Canada especially to judge the event. Mark believes she is one of the best cows he has ever seen. Highlights over the two days included the Embryo Tag Sale, The “Global Classic” Sale, The International Youth Dairy Championships, the presentation of the first John Dennison Achievement Award. There were over 150 trade stands, commercial, machinery and educational exhibits. It was attended by visitors from across the UK and as far afield as Canada, Finland, Ireland and Vietnam. Running throughout the event was the UK’s first ever Embryo Tag sale in which buyers were able to buy lots, on a first-come first-served basis,provided by breeders from the UK, Ireland, Europe and Canada. Entries came from Sterndale, Ridgefield, Hays Genetics, Absolute Genetics, Drointon, Nosbisch Holsteins Germany and Butlerview Farms in the USA. Seven different countries purchased embryo’s and the new initiative was deemed a success. The Reserve Champion was Rebecca Channing, and Michael Yates received an honourable mention. The Global Classic Sale on Friday night saw the show ring full of some of the country’s best livestock genetics for purchase by international and domestic audiences. Buyers attended from Japan, Finland, Holland, Italy, Denmark, and Canada. Top prices paid were 4500 guineas for Redsky Fidelity Cherry Red, from Paragon Pedigree Herds; 4200 gns for Inspired Glenn Destiny from Brown Swiss Genetics; and 4000 gns for New Abbey Shamrock Pledge ET from A & A Bunting. The averages for Holsteins was £3230.77, Brown Swiss £4200, Dairy Shorthorn £2526, Ayrshire £2625 and Jersey £2415. Saturday was the chance for breeders to showcase their finest stock. Seven breeds of cattle – Holstein, Jersey, Ayrshire, Red & White, Brown Swiss, Dairy Shorthorn and British Friesian took to the show ring to compete for their share of the £15,000 prize money. The judging panel this year underlines the growing prestige of the show with top international judges from Canada and Switzerland coming especially for the event. 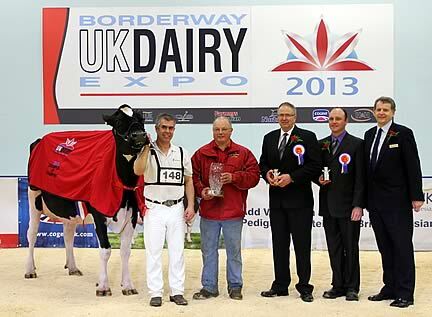 Canadian breeder Barclay Phoenix judged the Holstein classes. Also from Canada was Bruce Mode who judged the Coloured Breeds. Together with Monique Rey, who awarded the International Youth Dairy Championships, all are experienced cattle breeders andknow what it takes to make it in the show ring. Between them, they have judged many shows throughout Europe, Australia and North America. This year’s event saw the introduction of a special award - The John Dennison Achievement Award. The award is in memory of the highly regarded breeder of the Denmire Holsteins, John Dennison of Scales Farm, Ulverston and is presented by his family to the person judged to be an exemplary role model to the industry. Before the award was presented, the Dennison family said they believed it was a privilege and honour and that John himself would have been very proud of. Some of the furthest visitors to UK Dairy Expo this year was a delegation from Vietnam, involved in the country’s dairy industry. The dairy industry is in its infancy in Vietnam, and the party was from TH Milk, which is already one of the largest dairy organisations in Asia. With over 26,000 dairy cows, their dairy farming is on an industrial scale. They farm both independently and in clusters, with some farms being in the region of 5,000. Their company was set up by Afimilk, a dairy farm technology company owned by Kibbutz Afikim, in Israel. The stock is, in the main, Holstein Friesians from New Zealand. They saw everything, including the auction, and the main aim of their visit was to see how the dairy industry operated in the UK. Amongst their Highlights was Rubber Matting, which they do not use in Vietnam, and the Weather Protection Secure Covers. The event was supported by several high profile businesses representing all aspects of the dairy industry including CIS ,Cogent Breeding, Holstein UK and Norbrook Pharmaceuticals, and the Farmers Guardian. John Cochrane, UK Sales Manager of Cogent Breeding, highlights the importance of the event for him and the industry as a whole.